As you know, a pen requires a stable surface on which to use it. The same applies to a digitizer layer. In the traditional hinged design there’s often enough wobble to kill the pen experience and the same issue can affect the touch experience too so consider the slider design again. Consider the placement of the bottom of the screen towards the middle of the unit and consider that non-adjustable mechanism that holds it in place. It turns out it’s perfect for a pen because it’s a stable easel. Sony Vaio Duo 11 Specifications and information page with videos, images links and information here. I apologize to everyone that already knew about this. After 7 years of testing touchscreen devices I should have known this, but I didn’t. I will now do a Google search for an image and discussion on the subject. I’m sure I’m going to find something interesting. [Honestly, this is the first time I’ve searched for this reference.] I’m going to search for “slider pen advantage stability.” Ah. That just got me a lot of stuff about Insulin pens. Let me try “slider digitizer advantage stability”.] Oops, there’s my first impressions. OK, maybe not many people have realized the advantage of slider+digitizer (although I have to hat-tip Lisa Gade who’s also picked up on it in her review at mobiletechreview. Here’s a video showing stability and digitizer usage to make it easier to understand. Before I go into performance testing I want to talk in general about the Sony Vaio Duo 11. It’s the coolest Core-based laptop I’ve ever had. It looks and feels high-quality and when I took it into a conference recently I almost didn’t have the courage to open it for fear of raised eyebrows. It feels great when you pop it open though. It feels great when you’ve got the pen in one hand and you’re touching the interface with the other. It can get, after practice, extremely fast and productive. 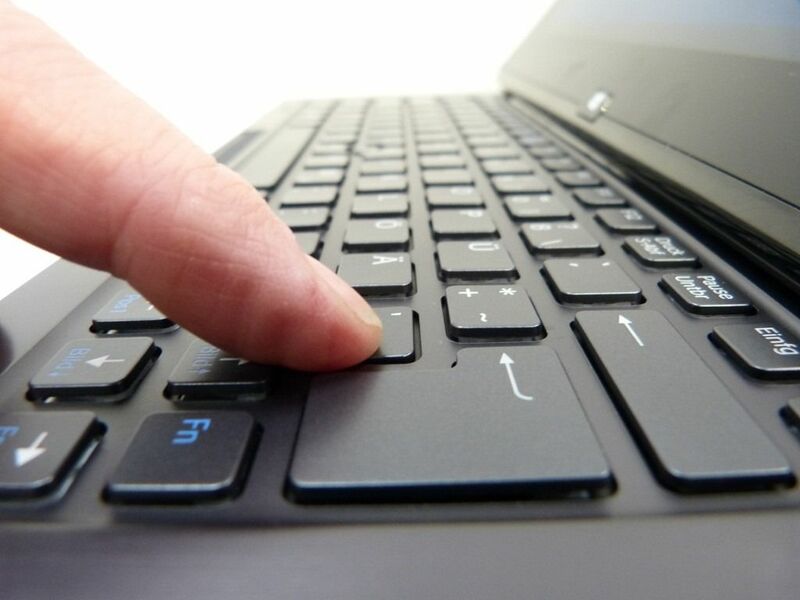 The digitizer re-animates those mouse-over menus that are lost with the finger and completes the tablet-based web experience. I love the ports on the Vaio Duo. It’s a perfect combination for me although I understand a Display Port connection would be preferred over VGA+HDMI for some people. (As I work across a lot of monitors and projectors, the combo works better for me.) Gigabit Ethernet is there for conference press-room uploading and home-based desktop activity with the Vaio connected to external screen and keyboard. The back-lit keyboard on the Vaio is something I miss as I type at 11pm on this Lenovo Yoga 13 and there’s something magical about the clarity, contrast ratio and punch of the screen. The speakers are good, the efficiency is good and it’s quiet and cool. As a tablet it’s the best Core-based convertible I’ve tested so far although this needs some perspective. It makes a horrible casual tablet. Sharp edges, heavy-weight, large lever effects and thickness means it’s just useless for occasional tablet use. Who wants to wait even 5 seconds for a tablet to turn on? Let’s talk about the other negative points of the Sony Vaio Duo 11. Efficient it is. Long battery life it doesn’t have. Sony have done a great job making the Duo get as much out of the battery as possible but it’s a tiny battery and you’ll need to think in terms of 3-4 hours usage per charge. There’s a $120 (and additional weight) solution to this problem in the chargeable extended battery which will double the battery life, and store the digitizer pen but that only adds more cost to the already expensive price. It also highlights that the digitizer does not have a garage on the unit. I haven’t seen the digitizer for the Sony Vaio Duo for a few days to be honest because it’s somewhere in my studio and I can’t be bothered to go and get it. That’s a problem. Keyboard: It’s poor for long-term typing. I can summarize by saying that it’s a 2-paragraph keyboard. After that point you start to feel the effects of the smaller keys. A higher level of concentration involved in using it. The same applies to the optical mouse trackpoint. That would have been so much better as a physical trackpoint. I appreciate it’s given more space to the keyboard and that it’s the best that can be done in the thickness and space available but at the end of the day, it’s not there for extended periods of writing. That might be OK for many though, especially as the slider design snaps into use very quickly as a laptop so responding in detail to emails that you’re reading in tablet mode is a reasonable experience. In terms of performance, Sony have done a good job in letting the Core i5 processor in this test device do as much as it can and still keeping noise to a minimum. Silent working is possible too. Have I seen any other issues? No, although I have a suspicion that the unit sometimes turns on in a bag. Is the exposed Windows button bringing it out of sleep perhaps? Before I go into performance testing (although you can skip this bit if you’ve already ready performance reports of other good Core i5 Ultrabooks!) let me say that I really think the Sony Vaio Duo is a special device. It’s the best laptop I’ve ever had on the arm of a chair (due to stability) and it’s the first Ultrabook convertible I’ve used where the digtiizer is really usable, fun and accurate (due again to stability.) It looks fantastic and I felt proud to be using it while I was out and about. It started conversations and among my family and friends it created a response far better than the usual polite feedback. People asked about the price. My daughter wants one. I hate to be honest with myself and say that it doesn’t fit my requirements. It’s like saying ‘no’ to something you’re allergic to, but want! I’m not going to highlight a complete set of performance tests here as we’re dealing with a Core i5 Ultrabook at the top of it’s class and if you’ve read just a single other review of an Ultrabook in the last year, you’ll already have an idea of what I mean. As always, office-style working is no problem, video playback is smooth and powerful enough for even high bitrate full-HD video cameras. 1080p video editing is possible, and even a bit faster than other solutions due to the very fast SSD. As for gaming, you’ll get some pleasure out of it but if that’s your focus, STOP! 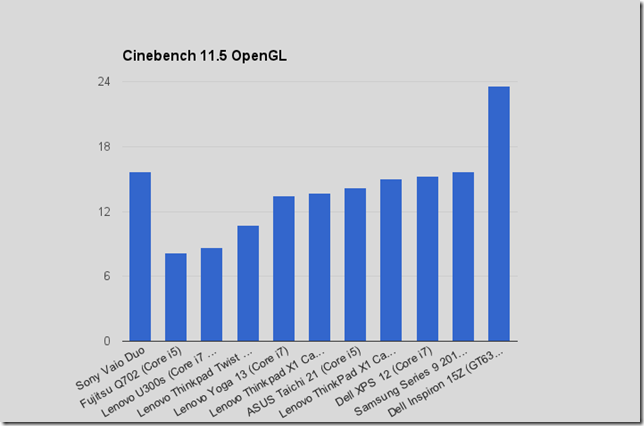 WAIT for the next generation CPU Haswell which, for a small additional price naturally, will double the 3D performance of most games taking it from borderline, to comfortable for anything but the latest 3D games. Again, if you’re looking to play games on an Ultrabook, wait until July. In September/Oct you’ll have a good choice and some better pricing too. 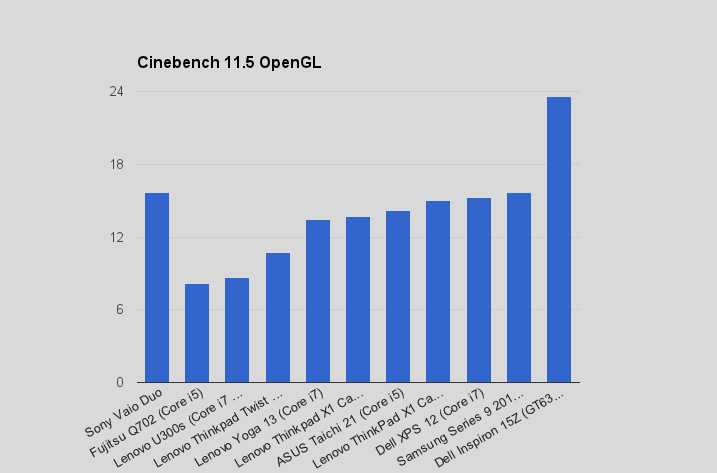 Cinebench scores are up there with the best we’ve seen. 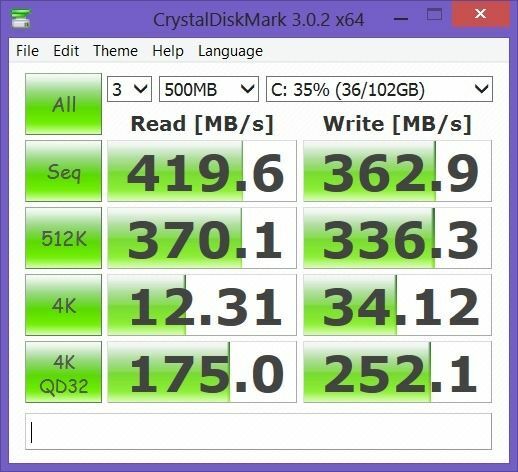 As for SSD, there’s little scope for improvement with current technology. 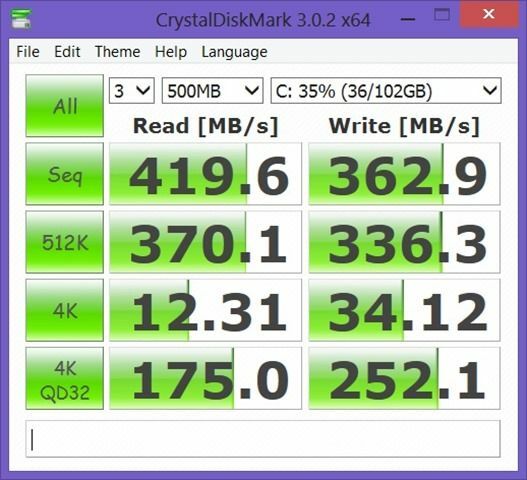 This is really up there with the best SSDs we’ve tested. As mentioned before, the Sony Vaio Duo 11 is efficient but has a small battery. 39Wh is down below what we’d normally recommend for a productivity device and battery life fits in with the general rule for Ultrabooks. Wh divided by 10 = battery life in hrs. Powercfg (a windows a tool that continuously monitors battery capacity) reports an average 3.75hrs battery life with the minimum being 2.75hrs and the maximum being 4.4hrs. Sony have an interesting accessory for the Vaio Duo 11 that needs to be taken into account though. The Vaio Dup 11 Sheet Battery (VGPBPSC31) offers an interesting solution. It clips onto the base of the Vaio to provide double the battery life and includes a storage slot for the digitizer. At $150 it is not cheap but it does include its own charging system and power cord to give you some real flexibility. The weight and size specification is not shown on the Sony site (here) but expect at least 200gm in weight and 20mm max height increase. It’s a flexible option, but not cheap and not ultra-thin. Attempting to open the Duo from the wrong side. With force, this could damage the hinge mechanism. No built-in stowage for Digitizer pen means you don’t always have it with you. 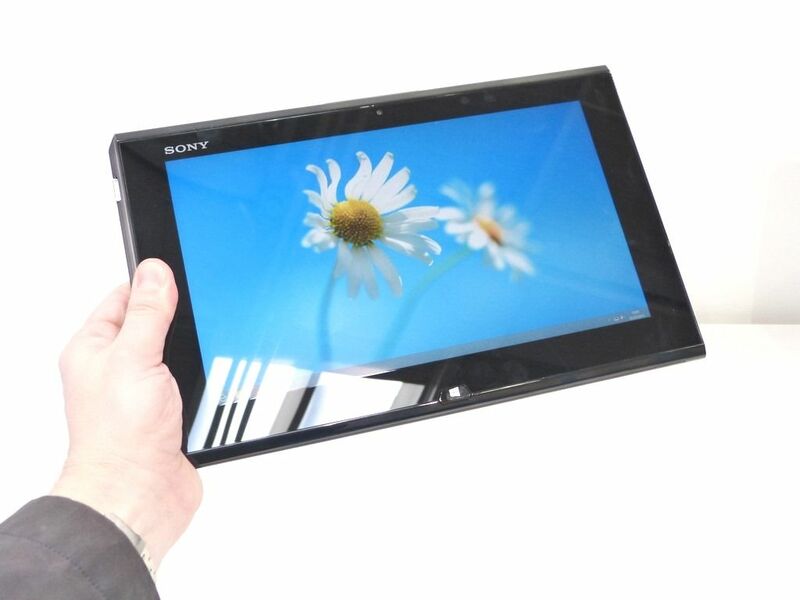 Vaio Gesture Control is a hand gesture recognition program. I tested it briefly and failed to get anything useful out of it. Accuracy seems very fuzzy and touchscreen seems faster and more reliable for the small set of gestures that only work in certain programs. Vaio Update worked without any problems to update the Duo 11 to the latest state. The Sony Vaio Duo 11 is a well thought-out slider-style Ultrabook Convertible that makes the most of its stable base because this is one of the best digitizer-capable devices we’ve tested and that includes going back to some of the smaller TabletPCs of earlier years. The form-factor lends itself well to desktop digitizing in ‘easel’ mode. The keyboard needs to be highlighted as a limitation. It’s a two-paragraph keyboard because after that it gets stressful and less productive. Also affecting long-term productivity is the relatively small battery capacity and battery life. Cost is also something to consider. If you’re looking to replace an older desktop with something that can perform all day with an external keyboard, mouse and screen and is ready to offer consumption and web duties in other places then take a closer look. The Vaio Duo 11 is lightweight, fast, quiet and extremely stylish. If you do buy one and have never used a digitizer, take time to learn how to use it because it’s fun, quick and flexible. Thanks to Intel Germany for the loan of the Sony Vaio Duo 11. It has been 1 month since I buy Vaio Duo. The slider stability + digitizer + OneNote = a paradise for a graduate student. Thanks for the feedback as an owner. Anything you’ve found that isn’t so good on the Vaio Duo 11? I hope for some better 11.6″ sliders when Haswell comes out. For example, a physical trackpoint, adjustable screen angles for better video chat positioning and adjusting glare, better battery life, better keyboard design, lighter and maybe that virtual bezel in tablet mode that Intel showed off. The Vaio looks like one of the better sliders out though. Wow, that’s a hefty price for something that I’m going to tire of typing on. It’s a shame about the keyboard because it would have been fun to have a play around with it. Yup. Although I’m not sure I could find a cheaper laptop with a better digitiser layer Peter. As someone who has owned the Duo since it came out, I disagree about the keyboard. I write MANY documents and the keyboard is just fine but will be a love-it-or-hate-it kind of thing. I’m actually writing my latest book on the Duo. It is very reminiscent of the keyboard that shipped with the old U70P. The sheet battery adds a little weight, but I don’t carry it often and it’s still sub 4 lbs. I consistently get 4.5 hours of battery life without the sheet. The Helix is similar and the “extra” battery NOT optional since it’s in with the keyboard. The optical trackpoint should be on every computer – I love it. Again, reminiscent of the trackstick from the U70. My only issue is the ghosting problem with the IPS screen – it looks like Sony cheaped out a bit here. It’s a bit disappointig. You also don’t mention that this is the only ultrabook currently that I’ve seen which features a 512GB SSD option. This machine is quite road worthy (and it’s been all over the world with me). Your turn on concern in a bag is completely unfounded since it’s been in various bags since day one on planes, trains, and in automobiles. Quite honestly, outside of not being able to have 16GB of memory, this has been one of the more perfect laptop experiences (and I’ve owned quite a few). 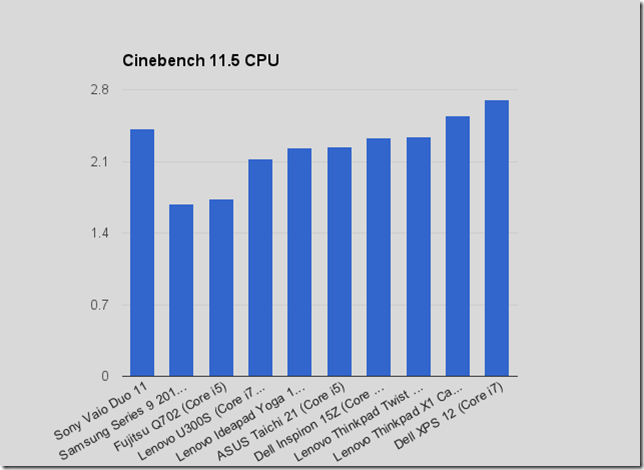 With the i7, performance is perfectly fine (and I run VMs for demos). Another thing to mention is that on a plane, it’s excellent. I’ve had plenty of smaller computers and this one has worked the best outside of maybe the Panasonic J10. Would you consider buying this Vaio Duo 11 or the Lenovo Thinpad Tablet 2 with digitizer? Intended use, note taking and some programming (informatics student). I would like to sell my lenovo x220 with IPS, because I look for something new and a bit smaller. Hi Chippy, thanks for all the great reviews and news. I have been doing some research as I’m considering upgrading my 4 years old school laptop for one of these new hybrids with an active digitizer for heavy note taking and typing. After having tested the Duo 11, would you recommend it for heavy productivity work – I usually have ~10 or more pdf, word docs, power points, etc. opened at once as I use it for school purposes [college student] (taking notes, typing research papers, preparing and displaying presentation, web browsing, and occasional multimedia use when I’m traveling or on free time, etc.). My main concern about this device is the lack of a mouse track pad and the crammed keyboard (the battery life is not one of my biggest concerns as I’m used to get barely 1:30 hrs with my old outdated laptop). I run VMs with VMware Workstation all the time so workload is not a problem with the i7 and 8GB of memory. As I said, I love the trackpoint and the keyboard is fine for me. I write plenty of documents on it. You should try it first to see if you like the keyboard or not.